Razorback 7 is a modern 1 bedroom apartment for 3 guests. Perfect for couples with a Jindabyne CBD location means easy stroll to restaurants and supermarket. There is a compact equipped kitchen with mid sized fridge/freezer and a living area featuring a TV, DVD and reverse cycle air conditioning. Just 3 doors up from the unit is Birchwood Cafe and across the street is Takayama Japanese Restaurant. These two establishments are at the top of the cafe and restaurant scene in the Snowy Mountains. Woolworths and Jindabyne retailers are all within a 2 minute stroll. The upstairs loft style bedroom features a relaxing queen bed and there is a sofa bed in the lounge for one person. There is no WiFi provided but you can order 22gb of Telstra 4G Mobile Broadband Wi Fi with your reservation at this property. Razorback Apartments are the most central of all our apartments and are located in the same building as Ray White Jindabyne & Snow Escape Holidays. You can forget your car after a day in the mountains and walk to shops, supermarket and restaurants! Apartment can experience noise if adjoining apartment has a noisy guest! Easy check in. Very friendly! Had a great time.. would definitely stay again. Enjoyed being in the centre of town. Cosy and centrally located. The place was all we needed. Great location, walkable to everything. Clean room and not as noisy as other apartments. Thanks for organising such a seamless experience. Arriving late can be tiring, but your clear instructions and the nice touches of a warm apartment with music on arrival made it all very pleasant. A stylish and modern apartment in the most convenient Jindabyne location I've ever experienced. Peter went out of his way to ensure the place was perfect on arrival, providing much appreciated instant relaxation after a long drive. Peter was very welcoming and informative and went above and beyond to make our stay pleasant and memorable. We had a great time and will surely be back! The apartment is very spacious, clean and cosy and is also equipped with useful appliances to make even a longer stay perfectly comfortable, such as washing machine and dryer. 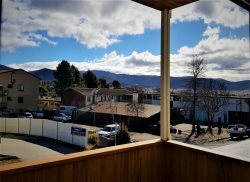 The location of the apartment is brilliant as it is right in the heart of Jindabyne, literally steps away from all the great restaurants, shopping centre and of course the beautiful lake. I loved the fact that Peter was so communicative and sent us an easy pre-arrival check in form. Peter also picked up brochures and gave us a handy package which was wonderful...it even had a sweet touch of little easter eggs. We loved the arrival process and the information provided pre-trip and during our trip. Very helpful team.